Jedi are in crazy shape, but how do they get that way? In the original Star Wars trilogy, we see Luke backpacking across Dagobah in The Empire Strikes Back, but that short time with Yoda was hardly marathon training. We see various younglings and padawans training in the prequel trilogy, but we don’t see a lot of detail regarding what makes up the biggest part of Jedi training. We learn in the Star Wars EU (novels, games, comics, etc.) that Jedi training was both incredibly intense and incredibly focused, with each prospective knight working on a regimen that catered specifically to his or her strengths and talents. Which is like, coincidentally, our current fitness landscape. Within each gym, we can find strength trainers, cardio bunnies, yoga pretzels, and everything in between. There are exercises and routines for every style and within each style, there are icons and mentors for people to emulate. But if you’re the geeky type of athlete, you might not relate to Usain Bolt as much as you would Obi-Wan Kenobi. And that’s okay. There are still plenty of role-models to choose from. They just might be from a planet in a galaxy far, far away instead of Planet Fitness. In Star Wars: The Old Republic, Jedi are separated into two archetypes: Jedi Knight and Jedi Consular. What does this mean for you guys and gals? Well, if you look at these classes at their most basic elements, Jedi Knights are more lightsaber oriented and smashy-smashy–which indicates their training was more focused on resistance and weights. And because Consulars are more concerned with enlightenment and delicate control of their bodies, that would point toward their regimens being more yoga- and/or cardio-oriented. Now, we all know that in real life, physical fitness, healthy living, and exercise is a bit more complicated than that. Like the Jedi, we often supplement strength training and cardio with martial arts training, gymnastics, CrossFit, or whatever else we like or are good at. With that in mind, we can look at a handful of our favorite Masters and Knights and figure out–through looking at their personalities and actions–exactly what kind of training they do. Who’s Your Jedi Fitness Icon? Without a doubt, there are entirely too many Jedi (and Sith!) to cover in a single post. There are more than enough characters out there that each and every one of us can find a very specific Jedi to emulate, fitness-wise. So we’ll start with an easy Jedi Fitness Icon–Yoda. Okay, so Yoda’s my favorite character in Star Wars. Not only is he all about enlightenment and inner peace, he knows how to bounce–literally–when the time comes. In The Empire Strikes Back, we see his less-serious side when he meets Luke and Artoo, and we see him beat the living snot out of the Emperor in Revenge of the Sith. 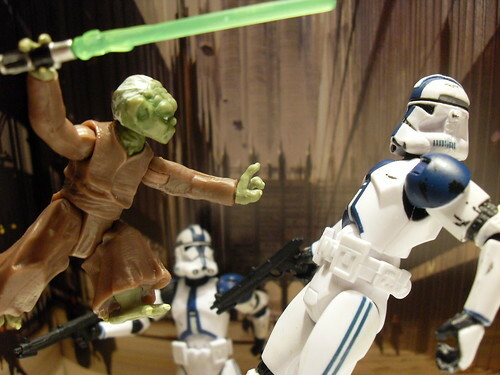 Despite being 900 years old, this tiny, green Jedi Master is in fantastic shape. Well, first of all, I’d say Yoda does a lot of yoga (hooray for rhyming!). He’s solidly in the Consular category because of his spiritual personality and emphasis on clearing one’s mind. There’s no way he isn’t meditating daily to keep his mind in tip-top shape and avoid the cognitive deterioration that often comes with advanced age. His focus on yoga is also apparent as we watch his duels with Emperor Palpatine and Count Dooku. He’s a bouncy, flexible whirlwind of awesome, and there aren’t many ways to be that connected to your body without practicing yoga. Sure, running and lifting can let you really get to know what your body is capable of, but yoga just lets you get to know your body. You learn how every inch of you feels and how it reacts alongside the rest of your body. Add in how Yoda was bouncing around, flipping and keeping himself limber, and if you want to be like Yoda–since I doubt that any of us have enough understanding of the Force to bolster us, we’d have to practice either gymnastics or CrossFit. Those kinds of moves really take a lot of focus and practice that a squat rack or treadmill just can’t provide. We’ve all seen the awesome displays of Olympic gymnastics, but have you ever watched videos of a CrossFit competition? With all the jumping and leaping, ring work, and plyometrics, CrossFit competitions look a lot like watching one side of a fight between much taller Yoda wannabes. So if you’re like me and have always wanted to be a Jedi like Yoda, then from my perspective, you’re going to need to focus on yoga and gymnastics at the very least, and potentially work in a varied crosstraining program like CrossFit. Agree or disagree? 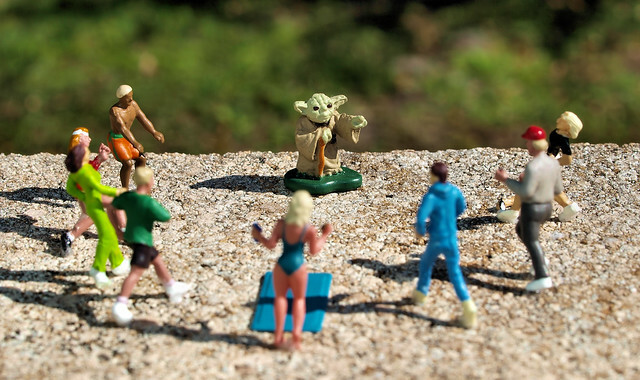 How do you think we can get a little more Yoda in our fitness routines? awesome article. It inspired me!